Big Beach is long, wide, beautiful, and extreme. In a nutshell: Big Beach is a beautiful, long, wide, undeveloped sandy beach. Impressive, with huge views and a large shore-break. Big Beach is a must-see. Minuses: A wicked shore-break exists here when the surf is up that can be dangerous for the inexperienced. 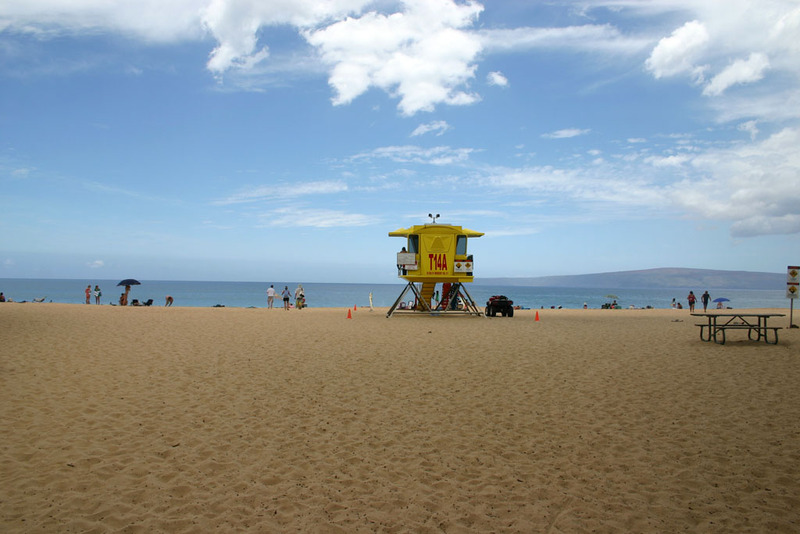 One of the most outstanding beaches in Maui. 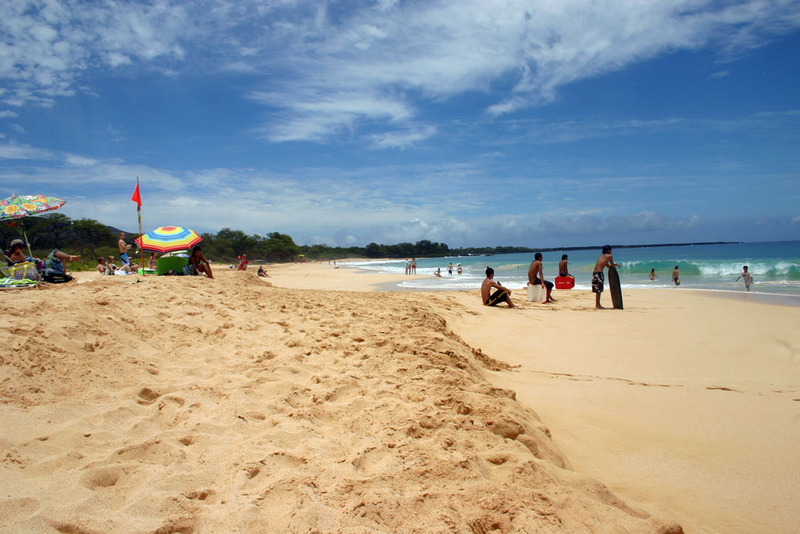 Big Beach is well over a half a mile long, and is also uncharacteristically wide by Maui standards. That means loads of real estate to stake out your claim, and this beach, while always drawing lots of people – is never so crowded as to be packed. 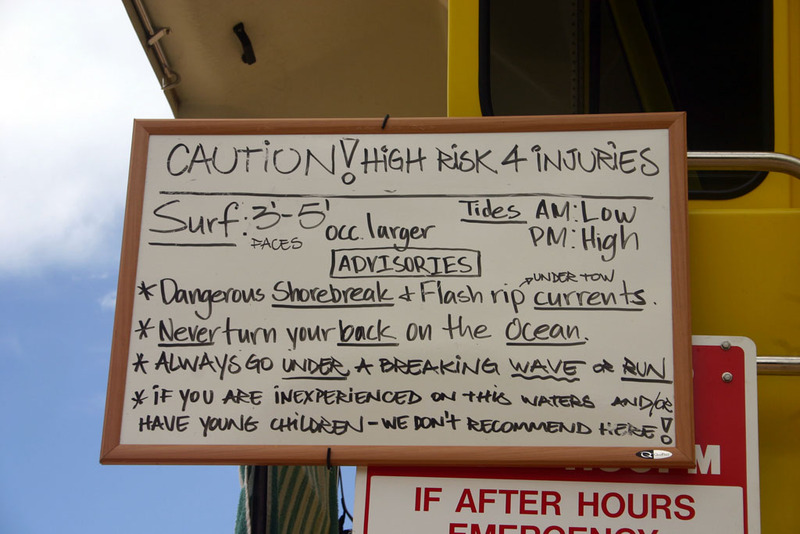 Let me start by saying this: don’t let the warnings below scare you off – even if you don’t swim well, this is not a beach to miss from sightseeing standards alone. Sign on the lifeguard stand warns people not to go in unless they are experienced using this beach. Big Beach has a significant on-shore break that can be downright brutal when there is a large south swell. This is never a beach that is safe for small children or inexperienced swimmers. Adults might want to think twice during high surf, as well. In recent years three lifeguard stands were added. If any beach on Maui should have had lifeguard stands, this is it. This is one point glossed over in most guidebooks, and is very important that visitors know: the waves here are often big, and powerful. The shore break crashes right at the water’s edge, and you should always enter the ocean here cautiously. If in doubt, consult a lifeguard. Yeah, this guy stuck the landing. 10.0! When the surf is up, you’ll also be front-row to the most extreme boogie boarding you’re likely to see during your visit. The photos below were taken during the tail-end of a receding south swell. There are also a handful of food vendors that operate out of trucks inside and just outside the park. Jawz Tacos is usually in the parking lot and you really can’t do wrong with them, they’re particularly ono. Facilities: Bathrooms, lifeguards, picnic tables. I was here in 2000; the people I were with were snorkeling about 40 feet away out in the water. I had on my snorkel gear and next thing you know I was in an undertoe. It felt like I was in a washing machine… I had no idea which way was up or down. I had been under a long time and came to the conclusion I was going to drown… a strange calmness came over me and I “remembered” to “swim parallel to the shore”.. I tried a few different ways (since i had no idea of direction), and got out of it after being under the water for at least three minutes. I realized at that point I had lost all my snorkel gear but I wasn’t about to go back in the ocean to get it! I am a really good swimmer but I wouldn’t suggest anyone to go swimming here. First day of our vacation here, my wife almost broke her neck and ended up in the emergency room. She bruised her spinal cord and has burning pain that runs down her arms that fortunately will go away. I watched the wave that hit her and almost killed her. It was disturbing. It could have been worse, it could have been my son that got hit by that wave. Not only is she lucky to be alive, she’s lucky that she didn’t get paralyzed from the neck down. There were no lifeguards on duty, and I really feel that this place needs more signs and warnings for those of us that are coming from out of state. We went to Makena Beach by the recommendation of a friend but ended up at the wrong part. That is too easy of a mistake for someone coming from the mainland and who’s never been here before. This beach is a death trap and it needs to be properly posted. But, I will add that it is a gorgeous beach and definitely worth walking on. I am pretty sure the was a hurricane that week, probably the wrong time to be out. Just came across the comments now. Big beach is a beautiful beach but dangerous.. The waves are huge and be extra careful when in the water. My husband suffered a spinal cord injury from this beach in 2013 as he was knocked down by the wave and was pushed to the oceanfloor. He was paralyzed from neck down. From an active middle aged man to now a disabled man. He ended up in Maui ICU for almost 15 days and that’s where we practically spent our holidays then. Be extra careful in this area. I almost drowned on Big Beach back in about 2000. There were no lifeguard towers then. Besides my family and a couple boogie boarders, the place was empty. For most of the day, the waves were about 3-4 ft and super fun. My friend and I turned our backs on the ocean..next thing we knew, there were like 20 footers coming at us from behind. My dad got a lot of it on camera..until he realized that the situation had become dangerous. It was insane. My friend and I were about 2 ft apart..he was standing in the water and my feet were about 5 feet above his head because I was on the crest..The waves kept breaking further out..Eventually, we both caught a wave in at the same time but that was after about 10-15 minutes of being thrown around, having my bathing suit ripped off, and being pinned on the ocean floor a few times. Nobody told us how dangerous the beach could be until after we almost drowned..but it was a beautiful beach. I’d go back. 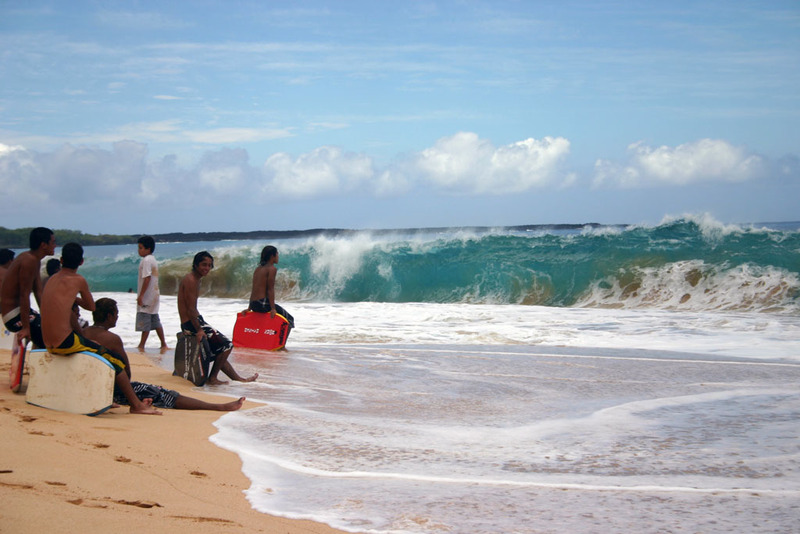 Been to beaches all over Maui, this beach with a swell can be a killer. The beach is quite steep just where it enters the ocean, as such when a waves breaks on it literally pulls you down, slams you and pulls you out . Other breaks that have a more gradual entry into the water do not seem to have this effect. Those breaks hit you but there is ample time to get up and walk out because it’s a gradual incline..Be extra carefull here folks. NEVER turn your back to the surf here………I did for a moment and a large “sneaker ” wave knocked me down and broke my ankle……I did not let that spoil a great vacation! An ace wrap and a cane and I was good til I got home! Tough lesson learned…,,,.At least it was relatively minor injury compared to some stories I’ve heard about Big Beach! Yes Mary, the way to get to Little Beach is a path over the rocks from the north end of Big Beach. It is such a popular place that you are sure to see people coming or going on the trail when you visit, so just walk to that end of the beach (right end of beach if facing ocean) – by the time you get to the end of the beach you will likely have seen someone come or go! Why isn’t that sign placed at entry points near parking, etc. ? Ask staff at Maui Memorial hospital what they think of Big Beach.